Maurice Scales, 27, of Minneapolis. 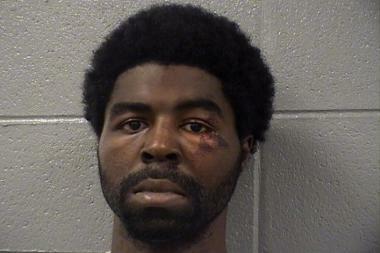 COOK COUNTY CRIMINAL COURTHOUSE — Prosecutors said a Minnesota man fondled a sleeping woman at Union Station Saturday morning and then punched her in the face when she called police before also attacking a man who tried to help her. Maurice Scales, 27, of Minneapolis, was charged with felony criminal sexual abuse with force and misdemeanor battery. The 24-year-old victim, of suburban Johnsburg, decided to lie down on a bench and wait for her train at Union Station Saturday morning, according to Assistant State's Attorney Jacqueline Kwilos and a police arrest report. Scales then sat down next to her on the bench and began stroking the woman's buttocks, Kwilos said. At first, the woman ignored what felt like a light touch, but she felt it a second time and sat up, according to the report. She saw him sitting next to her and asked him, "What the f--- are you doing? Don't touch me," according to the report. Scales said, "Be quiet, are you crazy?" before the woman cried for security, the report said. The woman called 911 and told an operator a "pervert" wasn't leaving her alone when Scales stood up and punched her in the face three times, according to the report. A 33-year-old man stepped in to stop it, and Scales punched him in his head, according to the report. Another witness also tried to intervene, according to Kwilos, but apparently wasn't harmed. Both victims and the witness chased Scales as he headed out of Union Station, Kwilos said. He was soon detained by Amtrak Police in the first block of Canal Street about 7:25 a.m., according to Kwilos and the report. Judge Adam Bourgeois Jr. ordered Scales held on a $250,000 bail.